Recognizing the lack of prams designed specifically for fly fishing, Spring Creek Prams was started in 1994. Our first design, the Stillwater Classic, is based on a 350-year-old design that has proven to be rock solid. A perfect craft for stillwaters. Once that was perfected, we started on the Hopper Series which addresses other water conditions and weight capacities. The Troutstalker is our pride and joy. We are passionate about quality and delivering a product that fits the need of each of our customers. We look forward to hearing from you with any questions and will happily walk you through creating a pram that meets your needs. Jim Wheeler's passion for fly fishing began as a kid tying flies for his younger brother who fly fished. 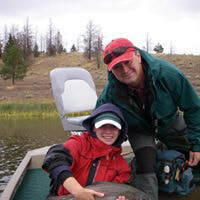 A couple years later he picked up a fly rod and has been fly fishing ever since. Growing up in Western Washington, Jim has always had a boat and been around water. Always having to have something to do with his hands, Jim found his passion for building boats.